98 Christians ‘reconverted’ to Hinduism in Tripura! As the red bastion gave way to the saffron brigade in the tiny north-eastern state of Tripura, the Hindutwa agenda has also come into force in full gear. A recent example is the conversion of as many as 98 Christians from 22 tribal families who were reconverted to their original religious faith Hinduism through a yajna. The Rashtriya Swayamsevak Sangh (RSS), known as the driving force of the Bharatiya Janata Party (BJP) has launched its contagious ‘ghar wapsi’ campaign across Tripura. The incident has taken place at Kailashahar in northern Tripura’s Unakoti district on Sunday. 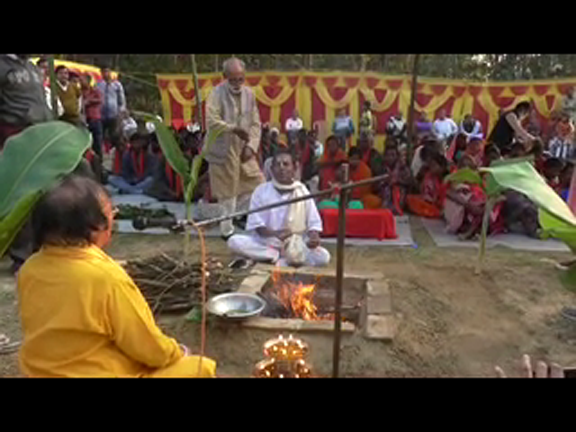 Local Hindu Jagaran Mancha leader Manimoy along with Gayatri Kunja, a local Hindu outfit, organized the conversion ceremony to help the people of Kablipura Ranchitilla to return to their original religion ‘Sanatan dharma’ after they wished for it. The yajna was conducted by Chandrakanta Singha, president of Gayatri Kunja. The reconverted people are workers of the Sunamukhi Tea Estate at Jalai and they belong to the Orao and Munda tribes. Notably Tripura was ruled by the Left Front for almost quarter century. The Leftists being atheists did not bother about the conversion to Christianity under the aegis of the missionaries. Moreover, the Lelft rulers were more than happy that the tribal population through these Christian missionaries were getting several facilities including easy access to health and education. But now with the change in scenario, the saffron drive of ‘ghar wapsi’, a move to reconvert people into Hinduism has taken Tripura also into its fold.